Been awhile, just a few things I've worked on. 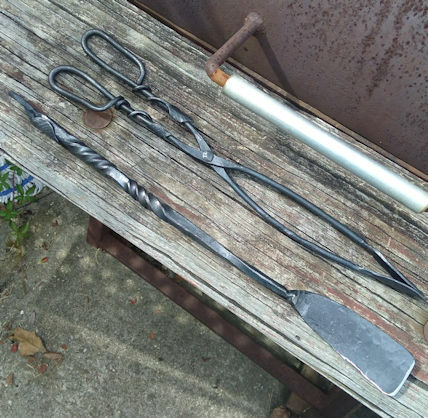 - The Iron Forge Fire Blackmithing Forum. Hey all, I hope you all have been doing well. Its been awhile since I've checked in so I thought I'd post a quick update on some of the little things I've been working on lately. 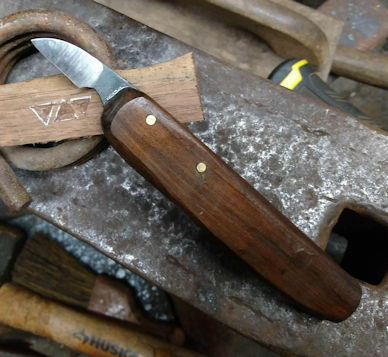 A little chip carver out of a hay rake tine and black walnut. 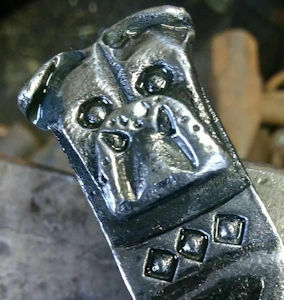 A "chained bulldog" letter opener. A leafy bbq set with a skinny spatula 😉 it was for a for a family friend, they seemed to like it. Initialed "Cigar nubber" my first commission off of reddit they use these to smoke the bitter end of cigars, so they tell me. 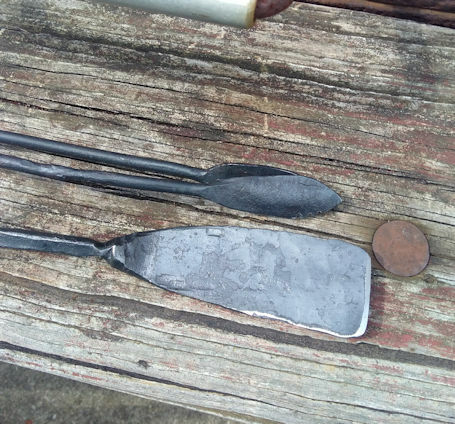 When it was too hot to forge, as in most of the summer, I started whittling. 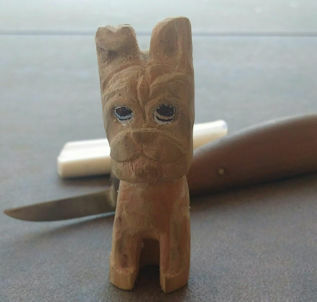 This is my favorite so far, whittlepup 😉 I picked up some whittling knives cheap and they have been pretty fun. Hope you all are doing well and forging great things. Love the update. Looks like you hsve perfected the bulldog. The leaf detail jumped right out on the tongs. Nicely done. I might give them a try myself. Yeah the bulldogs are my favorite thing to make still. The tongs were actually much harder than the spatula. I made them out of 5/16" round and making the halves match was difficult. But I was happy with the final product. I'll try to post here more often. For a good while I've just been doing instagram, I'm just lazy. Nice work, and yes the Bull Dog Motif is a good one and your look really well done ! The "pk" Cigar Nubber, curious to know how it holds a Cigar Nub... ? I have no idea ! 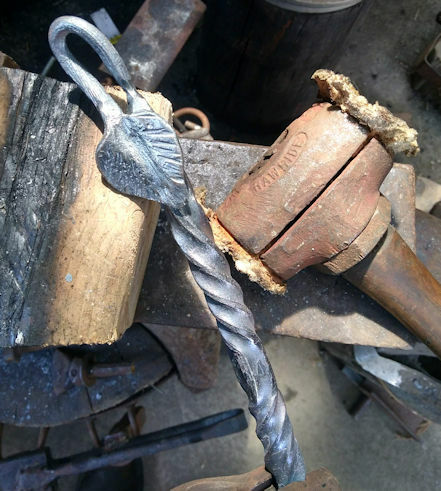 Have you ever thought about making a Bull Dog Key Fob, or a thinned out version for a Necklace for the ladies ? Thanks for posting your work ! I like your barbecue set. Particularly the leaf wrapped around the stock is a nice touch. The cigar nubber is basically just stuck into the side of the cigar when it gets short so you don't burn your fingers. I think most people just a toothpick or something but there are some custom ones out there. 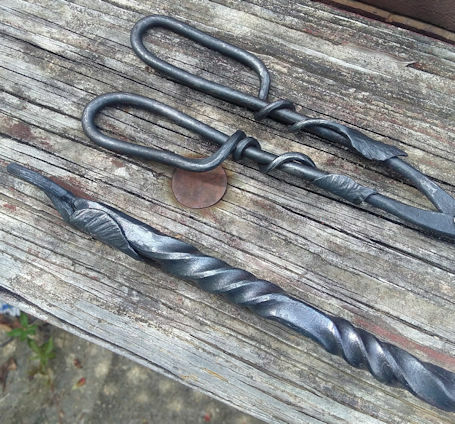 Someone commissioned that off of the blacksmith subreddit. 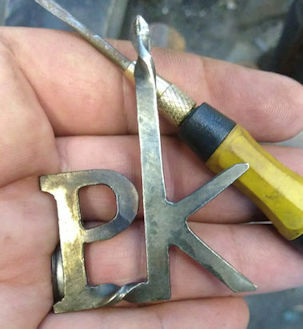 Yes I've thought about the bulldog fobs and jewelry, but all my tooling is set up for this size(1" flat bars). I think something like that would be better out of something like 3/4 or 1/2 x 1/8" I just haven't gotten around to make the tools for that yet. Yes smaller would be better for jewelry. 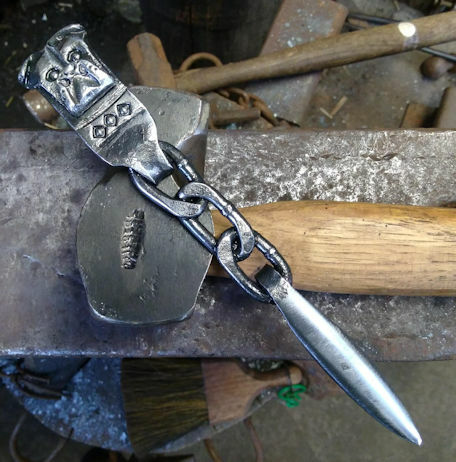 Wouldn't want to see a one half pound block of steel hanging on someones neck, LoL ! lol yeah probably wouldn't sell many.